Some 12,500 years ago people lived around this area. Both the Wakulla and the Aucilla Rivers are still giving up strong evidence of this distant age of early man in this area. The village of St. Marks has not been continuously occupied throughout its history since the coming of the first explorers. Therefore it is not usually given its correct spot as the new world's third oldest settlement. To better understand this statement we will need to recall events which have been covered in the Digest in prior years. Only a few years shy of 100 years before the Pilgrims landed at Plymouth Rock, Panfilo de Narvaez set out to explore, and claim for Spain, all of Florida. This trip, early in 1528, took him from his landing in the Tampa area across the Florida landscape toward the Apalachee provinces between the Aucilla and Ochlockonee Rivers. The Aboriginals (called Indians because Columbus thought he had landed in some remote islands off the coast of India) in the Tampa area told him the colored metal he sought was there in Apalachee. Of course the colored metal turned out to be copper and was no longer in use by the Apalachees (Copper had been utilized by an earlier civilization in the area - those who built the mounds around Tallahassee). Narvaez' visit to the Saint Marks area was one, unfortunately, like the one some tourists experience today while traveling in Florida. He was shot at. Frequently. But then he was no tourist! He had come to conquer and claim the land and what other booty he came across. His forces treated the Indians with great savagery. The locals were said to be quite large and very light skinned, much unlike the Indians he had encountered in the central and southern part of the state. But he was still prone to cut off noses, hands, feet, or what ever else came to mind of those he captured just to show his power. The local Indians were of greater stature and much more robust than the Spanish. The Spanish bowmen could not pull or draw the bows of the Indians and wrote that on occasions a Spanish horseman would be killed along with his horse as an arrow would penetrate the rider and continue on through into the horse killing both! The above is a pastel drawing, by F.D. Howard, shows the type of boat that Panfilo de Narvaez's crew probably knew as local fishing boats in their youth. Again, Narvaez was not a happy tourist when he reached the St. Marks area as his bedraggled force of nearly 300 was sick and hungry and anxious to "get out of town!" 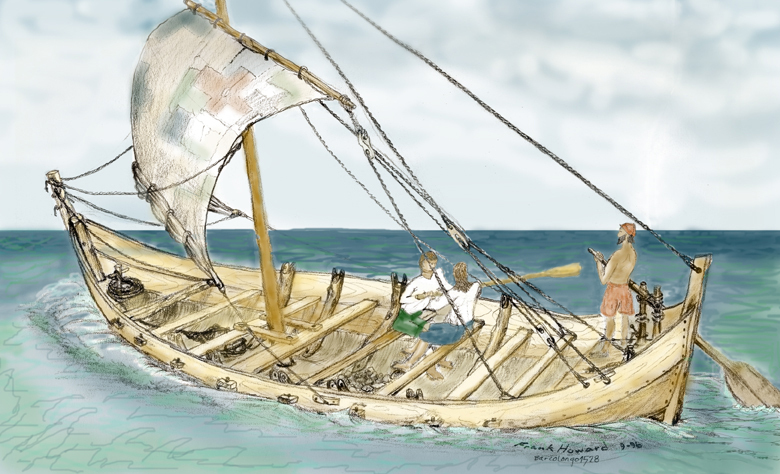 With no shipwrights, one carpenter and one blacksmith the group proceeded to beat swords, guns, and armor into nails and rigging as the first "ships" built by Europeans in this country were constructed. Five ships, or sailing barges, carrying about 50 persons on each, left Bayo Caballos (Apalachee Bay) late in 1528. Only 4 persons are known to have survived this group. And survive they did as it was soon known that the St. Marks area existed and could be used as a port. In 1539, Hernando DeSoto followed in Narvaez' footsteps so closely that he arrived at the very spot where Narvaez had built his forge and left the skeletons of the horses he had butchered and dried for food to take on the boat trip. Reportedly, the first use of St. Marks as a port was when DeSoto met one of his ships in the bay to send them and his fleet on further west (where they discovered the fine harbor of Pensacola). The next time we find St. Marks listed as a town or port is in 1639. This listing assumes that the town is known and has been a port for some time. This is also the year in which a shipment left St. Augustine bound for the Fort at St. Marks. The Fort is believed to have been a wooden watchtower possibly on the same site as the watchtower known in 1680. The first Fort was built in 1677 (of wood painted with lime to resemble stone) and was captured and burned by pirates in 1682. By this time the Apalachee Indians were considered peaceful missionized people. That is, those that were left, as between visits of the first explorer/conquerors Europeans diseases had decimated the Native populations. Some estimate as little as 25% of the original population remained. Spanish missions abounded throughout this area of Florida. In 1695 Friar Barreda described the huts of St. Marks as a wretched place. Indian goods were being exported in plenty to Havana and St. Augustine.. St. Marks not only was a port but the beginning point for a good road through Tallahassee on to St. Augustine. Unbelievable amounts of goods, mostly foodstuffs, were bourne on the backs of Indians as they trod that road to St. Augustine and back with imported Spanish goods for the colonists and missions. By 1718 there were villages of Tocobaga Indians at St. Marks and down on the River near the old watchtower site. These Indians did much coastal transport between St. Marks and the Suwannee area. Yamasse Indians had also moved in to replace the decimated Apalachee. By 1728 there are so few Apalachee remaining they could all be housed in the new Fort San Marcos de Apalachee. The Apalachee were no more. Those who had not died from disease or warfare had left the area to be assimilated into other tribes. When the English came in 1763 they found very few Indians (Many had left with the Spanish as both they and the Spaniards considered them to be Spanish - Cuba was the final stop for most.) and only one Friar for the two local religious houses, Jesuit and Franciscan. Strangely, a pair of Spanish soldiers remained as a garrison for the Fort. The Spanish returned in 1783 to find there was not much left to hold their interest. But a self-proclaimed King of Florida laid siege to the Fort, captured it and waited for the Spanish. A fleet of 14 ships quickly took it back and gave Spain a renewed interest in the area. They did not want England to get a toe hold on any Gulf sea routes. After having his supplies sent to St. Marks, Andrew Jackson left Fort Gadsden on the Apalachicola River and headed over this way in 1818 wiping out (completely) every Indian village in his path. His band of 1500 soldiers and 1800 Indians went through the Fowl towns of the Miccosukee area and down the St. Marks River destroying some 7 or 8 towns. They also took some 3000 bushels of corn and 1000 head of the Indian's cattle. Jackson then took possession of the Spanish Fort. While there he had one man hanged and another shot by a firing squad. Jackson Claimed the Spanish property for the United States and headed out for Pensacola. Shortly thereafter Florida was ceded to the United States and by 1823 St. Marks was the port used by those interested in establishing a new capital for the Territory of Florida. In 1834 the St. Marks railroad was chartered as the first in Florida and the third in the U. S. It began operation in 1836 and operated variously as a mule drawn train and as a steam driven one. By this time the port of St. Marks was the hub of a thriving area. Wagon trains and the new train brought some 30000 to 40000 bales of cotton a year into the area ports. Magnolia (1827), Rock Haven (1826), Port Leon (1837) and then Newport (after the hurricane of 1843) along with Port St. Marks was the outlet for all the cotton crops of the Red Hills area of Tallahassee and south Georgia. The town of St. Marks was moved in 1833! That's right - moved. Moved from a position closer to the Fort a few yards upstream to it's present location! As the area struggled to recover from the hurricane, war with seaport blockades crept into view. The Digest has carried extensive coverage of those war years. St. Marks began to recover by 1865, but the recovery was short lived as there was a great fire in 1868. Recall the Confederate troops had burned the foundry/iron works and many of the warehouses to keep them from the hand s of the Federals. Before the rebuilding had gotten underway the new fire cleaned the town out. The new then up to 400 feet of wharves was again gone. The rampant corruption in government throughout the South that followed the Civil War was particular savage in Wakulla County. Perhaps this could be a future story for some capable researcher. In 1872 records show less than 100 people in the two remaining towns of Newport and St. Marks.. Efforts to get the port restarted and the river dredged for the new deeper draft vessels died as railroads began to take the cotton across the state or up to the deep port of Savannah. Wakulla became a turpentine locale on that many of the county residents either supplemented or made their living from "naval stores" This lasted until 1928 when a hurricane destroyed many of the pine trees vital to that industry. At about that time St. Marks began its role as a fishing village. But the peaceful little village was sparked once again in about 1930 when Capt. O. P. Shields arrived and set up a cafe and began promoting the area. Soon the road was paved ( the Florida Governor, Sholtz 1933-37, remarked "Why should I pave a road to a community that only gave me one vote?" but then one vote is a brave vote). Shortly thereafter Highway 98 was paved and St. Marks was again open to the world. The advent of the Tallahassee power generating plant at St. Marks showed that the river could still be used for barge transport. Barge transports meant oil could come and be stored here. World War II saw much such traffic. Two barges in route to St. Marks from Texas were sunk by German submarines during this time. Today the size of the town probably triples when the boaters come down to start their weekend.